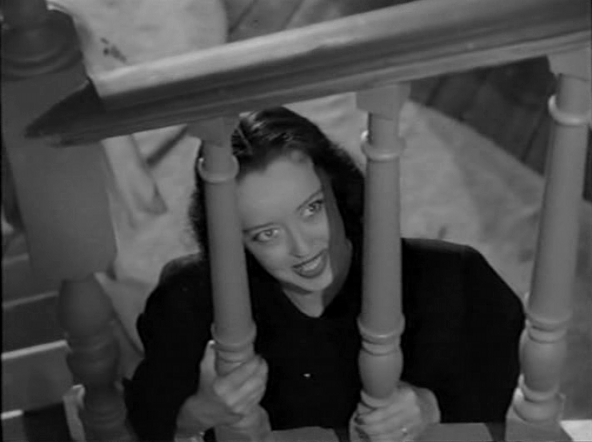 The wild saga of Rosa Moline (Bette Davis), trapped in the one-horse burg of Loyalton, Wisconsin, with her boring husband (Joseph Cotten), the town’s kindly and beloved doctor. Rosa watches the trains come and go, longing to jump on one and head for the big city of Chicago. She has desires and aspirations this sleepy town can’t provide, but she sees hope in one of its former residents, a millionaire executive (David Brian). She’ll get out of there, or she’ll die trying. I loved this movie even more the second time around. Davis makes for the most deliriously delightful (or delightfully delirious) femme fatale, and fire and venom and vinegar, spitting out those wonderfully nasty lines with glee. “You finally have the guts to hate me!” is just one of several gems in the script. Screenwriter Lenore J. Coffee penned at least one other fantastic noir — Sudden Fear — and I’ve got a couple more on my watchlist. Davis’s performance is gloriously hammy, campy, over the top. Cotten does a fine job as her entirely too tolerant hubby, and Dona Drake is a hoot as their petulant maid, but it’s really Bette’s show through and through. And boy, does she make the most of it. As devious and wicked as she is, I really do feel for Rosa. As a city dweller myself, I would hate to be stuck in some podunk town where the hottest thing going is a square dance. And you can’t help feeling sorry for her after that disastrous trip to Chicago, when she starts to realize the true limitations of her world. Moralizing preambles aside, surely Vidor meant for his audience to understand Rosa’s turmoil at least somewhat. This entry was posted on June 30, 2012 at 9:12 pm	and is filed under Movie Reviews. You can follow any responses to this entry through the RSS 2.0 feed. You can leave a response, or trackback from your own site.